Nellie, my open mouth bear with the full works. She has a built-up lip line, sculpted tongue, teeth, hand painted eyes with eyelids, clay paws, waxed nose... Her mouth can open/close, and lots of subtle shading and sculpting went into creating the bear just the way I envisioned her. I will be teaching a workshop to make Nellie on 17 November. There is only one place still available in class and there's homework to do. If you would like to join us, you need to jump to it. Below I have added pictures that show the process of making a bear with this type of head. In the beginning, there is not much to see. This bear could be anyone. Sculpting the inside of the mouth. This is the part I like least of all, but also the most important if you want to have a friendly bear who is anatomically correct. By now the lips have been added, and shading done inside the mouth. From here on the bear is heaps of fun, she was laughing all the while I worked on her. Teeth in, and working on the nose. 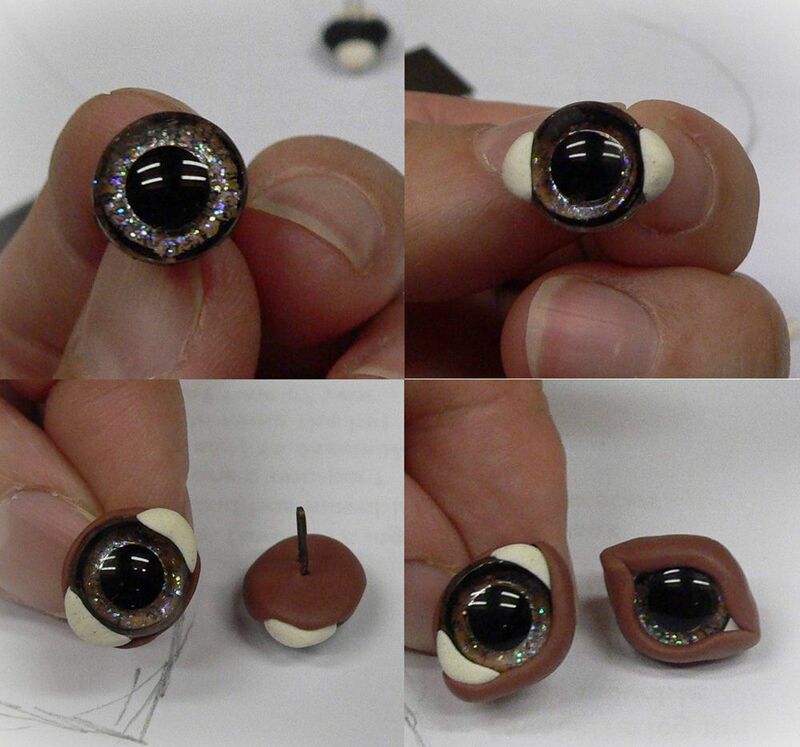 Painting the eyes, and making eyelids. 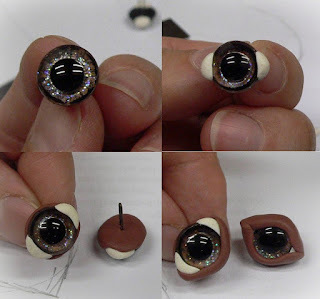 Eye sockets coloured in preparation for inserting eyes. Hard to believe that this bedraggled looking creature is going to be a beauty in a short while. The fur still needs trimming too. Now we are starting to get there! Trimmed around the eyes so that Nellie can see properly. Because the jaw is wired, Nellie's mouth can open and close. Here Nellie is completely finished. The crochet collar and flowers are a nice finishing touch, but not absolutely necessary on a realistic type of bear. You can accessorize her in any way you like. 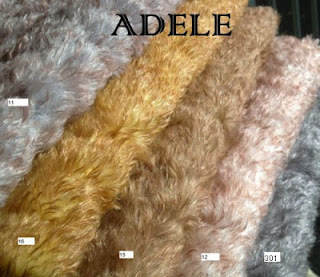 For this project we are using Loubear's new fabric Adele. Sy is baie mooi!! Ek hoop jy gaan die werkswinkel volgende jaar herhaal. What a beauty - and to think the poor girl smiled at you whilst you pulled, pushed, pricked and prodded her poor head. She is so brave. Wish I was the person filling the last place. I think of the poking like acupuncture. It cures the bear in early stages from smoking and overeating. That's why my sculpted bears are so well behaved. Would have been nice to have you filling that last seat. We need to get you wings so you can fly on over! Megan, she is just beautiful, I don't think I have ever seen a bear with an open mouth. I obviously haven't visited a Teddy bear shop in many years. I guess all projects have a part that we don't like doing much, but is essential for the finished piece to be authentic. Glad you like Nellie. Yes, open mouth bears and realistic animals are all the rage in the teddy bear world at the moment. Once you have mastered the basics, they are not difficult to make. Hi Megan...lanklaas gesels....hoop dit gaan goed...Nellie is te dierbaar vir woorde! Hallo Marie, lekker om van jou te hoor. Ja, dit was 'n woeste jaar maar ek het darem 'n paar baie lekker bere gemaak! Was that the ability to get the form on this bear on my mail renifer4842@gmail.com? ?